The county Council have been supporting the emergency services overnight dealing with a large fire at the Poundstretcher store in Blackwood. About 50 firefighters have tackled the serious shop fire, the High Street remains closed to all traffic and bus diversions are in place. 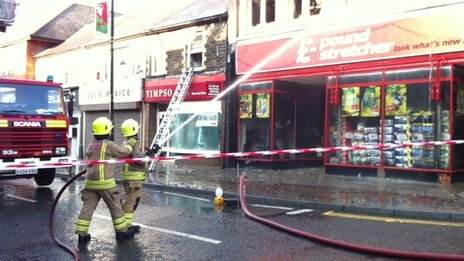 South Wales Fire and Rescue say the blaze at the Poundstretcher store in High Street started at about 02:00 BST on Wednesday and took six hours to bring under control. The road is closed and people are being urged to stay away from the area while those nearby should keep windows and doors shut. The building has been declared unsafe. Crews from Cardiff, Merthyr and Aberdare areas have been at the scene. Six engines and two hydraulic platforms have been used to tackle the flames as well as four other powerful water jets. At one point there was 14 appliances at the scene. 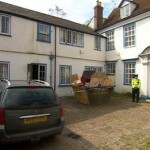 By 08:15 BST, the fire service said the blaze had been brought under control and the incident was being scaled down. A number of fire crews including a hydraulic platform will remain damping down. 200 vehicles burn in large scrapyard fire and emergency services had been alerted to the fire and reports of an explosion at 00:27 on Monday morning. The fire broke out just after midnight and around 70 to 80 fire fighters were tackling the blaze. One fire crew member had to be taken to hospital when a car exploded near him in the yard on the Randolf Industrial Estate in Dysart, on the outskirts of Kirkcaldy. Earlier, firefighters tackled a separate blaze in Fife at a large commercial outbuilding in the Rossend Castle area of Burntisland. A fire broke out in a garage in Ware last night (April 29). Crews from Ware and Hertford attended the premises on Gladstone Road at 8.30pm, Police were also in attendance. A member of the public living in neighbouring Berkeley Close alerted the fire crews. On arrival, firefighters found one motor vehicle in the garage well alight. 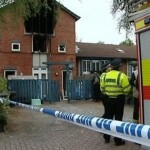 The cause of the fire was listed as doubtful. 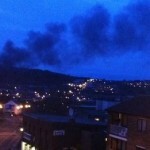 Firefighters were called to the Ski Village on Vale Road at about 20:30 BST last night. 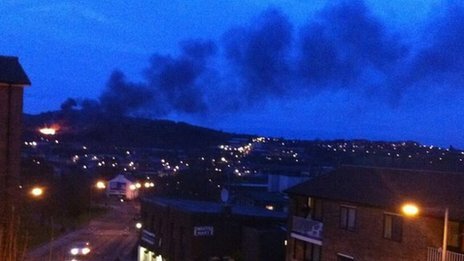 The fire broke out at a Sheffield outdoor ski centre, nearly a year after a series of fires shut down the site. South Yorkshire Fire and Rescue said the service had received more than 120 calls about the latest blaze at Ski Village on Vale Road. 21 firefighters were at the scene, a spokesperson said a large wooden shed and outbuildings were alight. The main building of the Ski Village was destroyed by fire on 29 April 2012. That fire was ruled to be an accident but investigations showed two further fires on 1 May and 21 May were started deliberately. 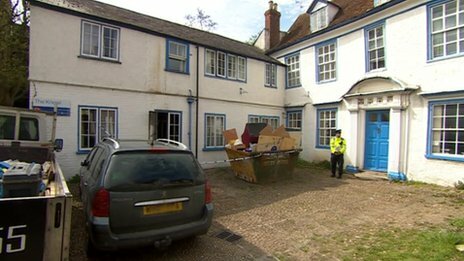 A man is in a critical condition after he was rescued from a fire at a care home in Oxfordshire. The blaze broke out at about 04:15 BST. the 48-year-old was rescued from The Knowl on Stert Street, Abingdon and was treated at the scene for burns and smoke inhalation before being taken to the John Radcliffe Hospital, Oxford. Oxfordshire Fire and Rescue Service and Thames Valley Police are investigating the cause of the blaze, which is being treated as unexplained.